A hold-off is recommended on the line to ensure the line is locked out after an automatic protection operation. A tailboard briefing is held with all workers before the work starts to ensure all procedures are understood. Proper safety precautions should be observed. Each person should know specifically what they are required to do. All workers should be made aware of any potential hazards. Each lineman gives his rubber gloves, rubber glove protectors and rubber sleeves a thorough inspection for wear, cuts, or contamination on both outside and inside surfaces. Rubber gloves should be given an air test to check for holes. Some companies require the worker to perform a water test in addition to the air test on the rubber gloves. No metal should ever be worn while doing work on energized lines. This would include but would not be limited to rings, wrist watches, identification bracelets, necklaces, ear rings, etc. All other approved or required PPE such as a hard hat, safety glasses, FR clothing and appropriate fall protection should be worn by the worker. The pole being worked on and adjacent poles are checked to ensure their integrity. The worker should be looking for rotted poles or crossarms, broken or damaged insulators, broken or frayed conductor or anything else that could possibly present a hazard to the crew. The aerial device is positioned in the most advantageous location. The stability, road clearance and bucket position required for the task are considered. The stabilizing outriggers are lowered. 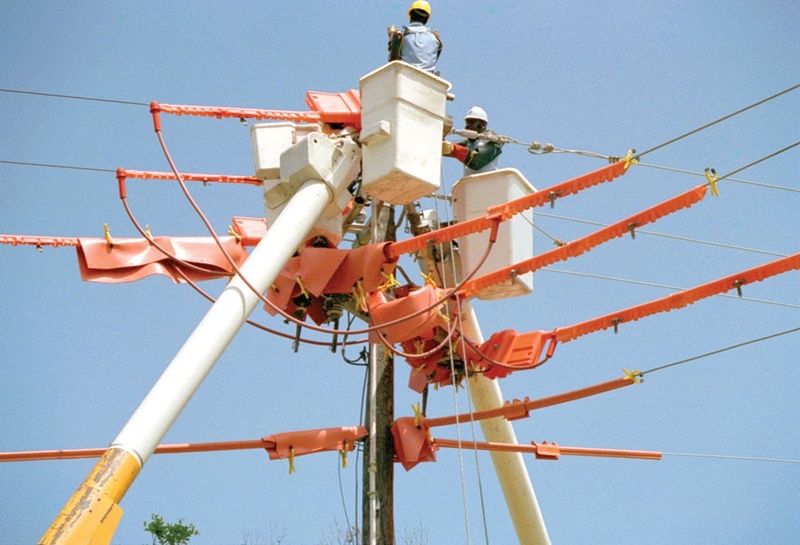 Workers can be protected from any hazardous differences in potential in in the event the aerial equipment comes in contact with the energized line by grounding the vehicle, bonding the mechanical equipment together, providing ground mats to extend areas of equipotential or employing insulating protective equipment or barricades. The insulating surfaces on the boom are cleaned and wiped immediately before undertaking the live-line work to remove any dust or contamination. Some utilities require the leakage current in the boom be checked under certain conditions. The voltage of the line is checked so that safety precautions can be taken in accordance with that particular voltage. The voltage indicator is checked before and after use to ensure it is working. The lineman should perform their work so all unprotected parts of the body maintain the approved safe limit of approach for that voltage. Safety covers are installed on anything that is at a different potential than the worker and that he might come in contact with. These include the crossarm, crossarm braces, pole, insulators, conductors, guy wires and equipment. During the work, the linemen should work as a team to inform each other of every move. Energized conductors are kept under control at all times. These 13 steps achieve the changing of a single insulator on a tangent structure, using rubber gloves and an aerial device.